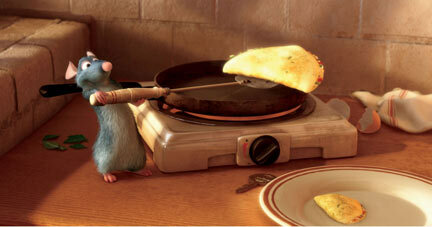 Today (Friday) we went to see the latest Pixar film, Ratatouille. It was a very good story skillfully told and animated in Pixar's increasingly amazing style. The level of detail in some scenes is simply incredible and, though the animated characters look, well, like 3D cartoons, they often move through photo-realistic virtual sets. The characters are appealing and have personality, especially true of the star rat, Remy. The overall experience was refreshingly enjoyable and, though small children may not "get" the sophisticated story, Ratatouille is suitable for all ages and enjoyable by most. Following the film and a quick lunch at Taco Bell, we took off for Hinckley Lake and the boat livery where we rented a canoe and paddled around for about an hour. It was a beautiful day on the lake with deep blue water below, light blue sky above, and forest green trees all around the water. Children in a kayak class provided some entertainment whilst great blue heron reminded us that this is also a natural area. A nice enough day but it's back to work with me tomorrow! And I happen to know there is work waiting for my return in the form of software problems and user issues. At least I've this Sunday off and that will make transitioning from vacation week to work week a little less of a shock.